Kyle Larson is on pole for Sunday’s Cup race. Rain washed out qualifying at Martinsville Speedway, putting Chip Ganassi Racing’s Kyle Larson on the pole for Sunday’s STP 500 (2 p.m. ET on FS1) on the basis of owner points. 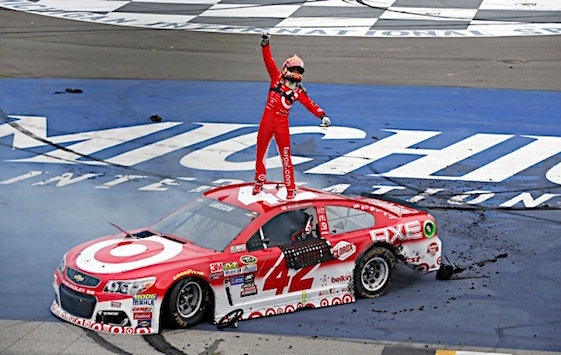 Larson, who won last weekend’s Monster Energy Cup Series race at Auto Club Speedway in Fontana, Calif. He finished third at the Martinsville short track a year ago. “It definitely helps to start up front,” said Larson, the only driver to earn points in the first two stages of all five races this season. “I think this will be my most difficult track probably to earn stage points in each of the stages, just because it’s not a track that suits me that well. Chase Elliott will start next to Larson on the front row. “I’m working through a lot of race tracks, for sure,” Elliott said. “Martinsville and Sonoma are, to me, the two that I feel like I need to work on the most. That’s not to say there’s not other places I need to work on. But I think Martinsville and Sonoma are the two places that seemed to give me the most troubles last year. (42) Kyle Larson, Chevrolet, Charter Team – 2017 Owner Points 1st. (24) Chase Elliott, Chevrolet, Charter Team – 2017 Owner Points 2nd. (78) Martin Truex Jr., Toyota, Charter Team – 2017 Owner Points 3rd. (2) Brad Keselowski, Ford, Charter Team – 2017 Owner Points 4th. (22) Joey Logano, Ford, Charter Team – 2017 Owner Points 5th. (1) Jamie McMurray, Chevrolet, Charter Team – 2017 Owner Points 6th. (21) Ryan Blaney, Ford, Charter Team – 2017 Owner Points 7th. (14) Clint Bowyer, Ford, Charter Team – 2017 Owner Points 8th. (4) Kevin Harvick, Ford, Charter Team – 2017 Owner Points 9th. (18) Kyle Busch, Toyota, Charter Team – 2017 Owner Points 10th. (31) Ryan Newman, Chevrolet, Charter Team – 2017 Owner Points 11th. (11) Denny Hamlin, Toyota, Charter Team – 2017 Owner Points 12th. (5) Kasey Kahne, Chevrolet, Charter Team – 2017 Owner Points 13th. (41) Kurt Busch, Ford, Charter Team – 2017 Owner Points 14th. (77) Erik Jones #, Toyota, Charter Team – 2017 Owner Points 15th. (6) Trevor Bayne, Ford, Charter Team – 2017 Owner Points 16th. (48) Jimmie Johnson, Chevrolet, Charter Team – 2017 Owner Points 17th. (43) Aric Almirola, Ford, Charter Team – 2017 Owner Points 18th. (19) Daniel Suarez #, Toyota, Charter Team – 2017 Owner Points 19th. (3) Austin Dillon, Chevrolet, Charter Team – 2017 Owner Points 20th. (88) Dale Earnhardt Jr., Chevrolet, Charter Team – 2017 Owner Points 21st. (27) Paul Menard, Chevrolet, Charter Team – 2017 Owner Points 22nd. (13) Ty Dillon #, Chevrolet, Charter Team – 2017 Owner Points 23rd. (17) Ricky Stenhouse Jr., Ford, Charter Team – 2017 Owner Points 24th. (20) Matt Kenseth, Toyota, Charter Team – 2017 Owner Points 25th. (95) Michael McDowell, Chevrolet, Charter Team – 2017 Owner Points 26th. (34) Landon Cassill, Ford, Charter Team – 2017 Owner Points 27th. (32) Matt DiBenedetto, Ford, Charter Team – 2017 Owner Points 28th. (10) Danica Patrick, Ford, Charter Team – 2017 Owner Points 29th. (47) AJ Allmendinger, Chevrolet, Charter Team – 2017 Owner Points 30th. (72) Cole Whitt, Chevrolet, Charter Team – 2017 Owner Points 31st. (15) Reed Sorenson, Chevrolet, Charter Team – 2017 Owner Points 32nd. (37) Chris Buescher, Chevrolet, Charter Team – 2017 Owner Points 33rd. (38) David Ragan, Ford, Charter Team – 2017 Owner Points 34th. (83) * Corey LaJoie #, Toyota, Open Team – 2017 Owner Points 36th. (33) Jeffrey Earnhardt, Chevrolet, Charter Team – 2017 Owner Points 37th. (23) Gray Gaulding #, Toyota, Charter Team – 2017 Owner Points 38th. (51) * Timmy Hill(i), Chevrolet, Open Team – 2017 Owner Points 40th.